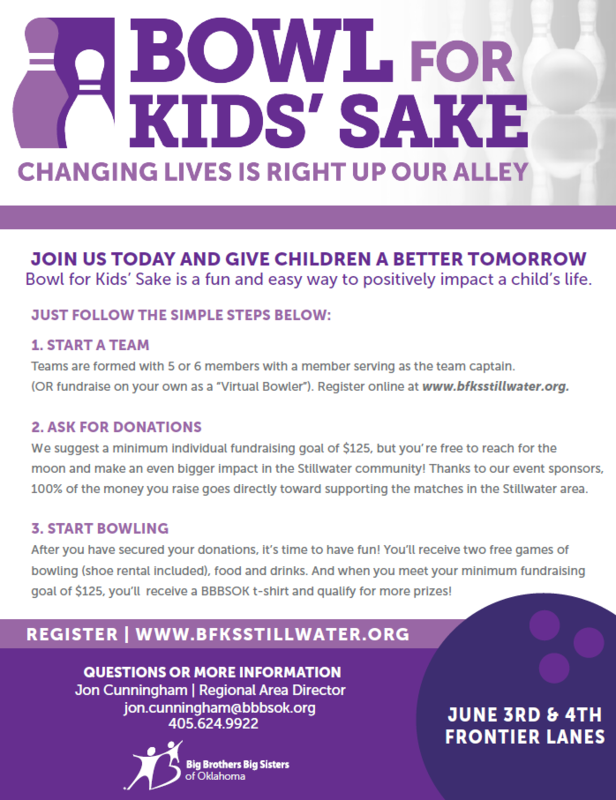 Bowl for Kids' Sake 2018 Stillwater Fundraising Campaign for Big Brothers Big Sisters of Oklahoma, Inc.
Help us support Big Brothers Big Sister of Oklahoma by giving to our team! One-to-one mentoring changes lives for the better, forever. Help us by supporting Big Brothers Big Sister of Oklahoma. It's for the kids! Join us in supporting Big Brother's Big Sisters of Stillwater. We want to raise awareness around our community for this great organization. Leadership Stillwater Class XXVI supports Big Brothers Big Sisters. Donate to help mentor tomorrow's leaders! First National Bank and Trust Company of Weatherford, Stillwater East Branch is participating in Bowl for Kids Sake this year. We are collecting donations to help with the Big Brothers Big Sisters of Oklahoma. Any and all donations are appreciated. Thank you!! Help us help kids in Stillwater!! Metro First Realty strives to make a difference! Support us as we bowl for kids. Any amount, small or large is greatly appreciated! Thank you. Just a group of Aspen Employees excited to support a great cause! Jarrod Winter gave a $26.37 donation to support Alecia Gray to support Buckets!